Performance – much of the architecture of Sisense has been engineered to deliver high levels of performance and scalability. Ease-of-Use – the front end, web based tools are easy to use for both dashboard creation and consumption. Innovation – Sisense is an innovative product exploiting low cost commodity hardware and delivering novel interfaces (IoT devices and messaging platforms). Adoption of AI technologies to assist in interpretation and detection of unusual events within data. Extensibility – optional use of third party graphics libraries and integration with R.
Modest in-built advanced analytics, although R can be used if needed. Sisense seems to have come from nowhere to become one of the best regarded contemporary business intelligence (BI) platforms. While the company was formed in 2004, it worked in stealth mode until 2010, and since then its uptake has been rapid and enthusiastic. Innovation is a major feature of the product offering, and particularly the in-chip technology, allowing complex queries on large data sets to be executed at lightning speed. 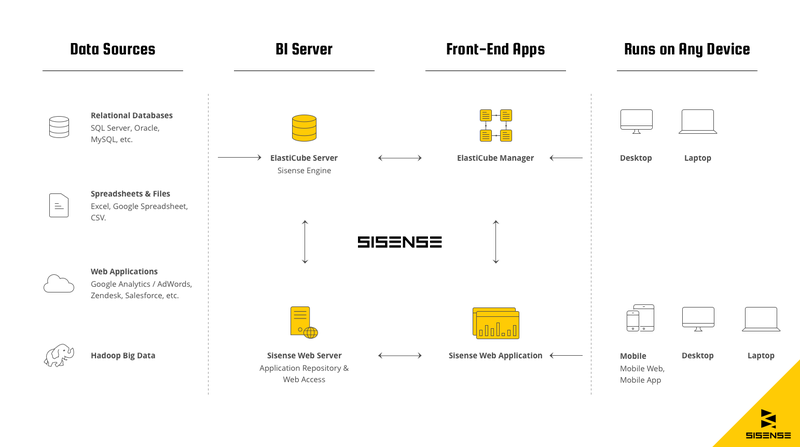 Sisense also offers a full BI stack, with front-end visual analysis tools for both self-service and production analytics, and a scalable, robust back end supporting connection to diverse data sources, data preparation tools and a centralized database that supports high speed data querying and reporting. Embedding is also a major feature of the product, allowing dashboards, charts and graphs to be embedded into production applications. More recently it has pioneered interfacing with IoT type devices – a simple example being a IoT bulb that displays a different color depending on the data transmitted to it, and Bots that use messaging channels (e,g, Slack) for collaboration. Sisense distinguishes itself from much of the competition by the execution speed of the platform, and the ease of use. Somewhat uniquely, Sisense offers prospects an opportunity to try their own data, and claims that significant capability can be implemented within just a couple of hours. The platform is also open, in the sense that it can employ third party graphical libraries if needed, can be accessed via a REST API, and interfaces to the analytical language R so that advanced analytics can be incorporated if needed. The positioning of Sisense is interesting, since it provides much greater capability than many platforms that focus on visual analytics alone, while at the same time offering the ease of use that many such platforms provide. It also avoids the complexity and expense of full-blown legacy BI suites, and its embedding capabilities position it very well for the current trend of embedding analytics into production applications. It should be expected that Sisense will continue to gain market share, since its innovative drive will keep it abreast of evolving trends in the BI market, and the combination of ease of use and high levels of performance (even on very large data sets) will mean it is attractive to business users and analysts who need a powerful solution without crippling complexity and cost. The BI market is complex, since the large number of BI and visual analytics platforms perform quite diverse tasks. At the lower end is the platforms which simply allow users to create graphical artifacts and combine them into a dashboard, but without any data management and preparation capabilities, and with little or no support for advanced analytics. These are essentially pure user interfaces, and the job of handling data is left to other tools. Considering that data preparation can consume 80% of the effort in an analytical task, these front-end products are best suited to simple tasks. Sisense clearly does not belong to this category of product. At the top end we come to products such as Spotfire, with its data preparation capabilities, advanced analytics support and supporting tools available from TIBCO. This in many respects is where Sisense belongs. The support for native advanced analytics is not as advanced, but the R integration does make up for this to some extent. However, Sisense also comes with some truly unique features that place it above most of the competition. It’s performance on all but the largest (billions of rows) and most complex of data sets places it above much of the competition in this respect, and particularly products such as Tableau and Qlik Sense – although it should be stated that performance is an issue that most of the major visual analytics and BI platform suppliers are now scrambling to address. What also differentiates Sisense is the level of innovation.The use of commodity hardware in-chip memory delivers levels of performance that are often a benchmark for others to follow. More recently it has developed interfaces to Amazon Echo and IoT devices, liberating data from the computer display and providing expression through other channels. Sisense Bots are also an innovation supporting interfaces to messaging services, and allowing users to collaborate via messaging platforms. In summary Sisense should be considered as one of the leaders in the new generation of visual analytics platforms, simply because of the scope of the capability, execution speed and scalability, and the level of innovation. However, along with virtually all other leading BI platforms, Sisense does need to embrace the move to AI powered BI – this will become a major differentiator over the next three years. At the simplest level Sisense divides into the web driven front-end, and the data handling back-end. The visual interface operates within a web browser and does all the things we have come to expect of a visual analytics platform – charts, graphs and dashboards. 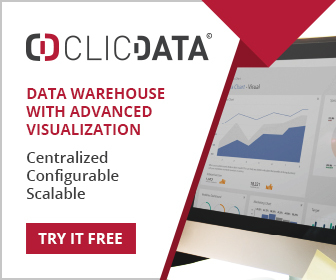 In common with many other platforms it provides an easy to use drag-and-drop interface for both creation and consumption of visualizations. The ease-of-use is well liked by many users, and becomes especially powerful when we consider the power of the back-end data handling capability. It should be added that Sisense is not primarily a cloud service, and is intended for on-premise installation. As with many platforms of this nature a server(s) is used for the grunt data processing and individual workstations (including mobile devices) are used to display visuals and access processed data. At the heart of the data architecture offered by Sisense is the ElastiCube. Data are extracted from the various data sources, ETL operations can be configured, and an ElastiCube is created to serve query and reporting needs. It is here that the highly performant in-chip technology is applied, along with the speed of a columnar database. Sisense claim that performance sometimes increases as more users access the system, allowing the various caching mechanisms to more intelligently assess which data should be cached. The ElastiCube Manager supports the creation of ElastiCubes, accessing multiple data sources and performing ETL operations. A visual environment is provided to make these tasks easier and less time consuming. Very complex ElastiCubes may need attention from a programmer, but most tasks can be accomplished by skilled business users. The ElastiCube Server facilitates the access to ElastiCubes. It runs locally and queries the ElastiCube Server. The Sisense Web Application provides an easy-to-use environment for the creation of dashboards, charts and graphs. It also allows consumers to access visual entities, and for them to be shared. Virtually all web browsers are supported, and of course mobile devices are supported by default. Sisense Web Server sits on a local computer and acts as host to the Sisense Web Application. Finally the Sisense Server Console provides administration functions for managing ElastiCubes on the ElastiCube Server. In the terminology used by Sisense, administrators can perform all functions, designers can do everything apart from access admin functions, and viewers can consume previously created dashboards with drill down capability. The use of artificial intelligence is making its way into Sisense, in a way that aids the analysis task considerably. A partnership with Narrative Sciences means Sisense can produce data narratives – descriptions of the most pertinent features in a visual. The Sisense Bot framework means these narratives can be automatically delivered to users when required. Another significant use of AI technologies is Pulse, a smart anomaly detection capability that not only sends notifications to users, but provides the mechanisms to integrate them with other apps. A very tight integration with the R analysis language, to the extent that many advanced tasks can be performed in a manner where R is transparent to a large extent. This includes the use of R functions in the formula editor, and the automatic formatting of visuals once data has been returned from R.
The scalability of Sisense is considerably enhanced using machine learning algorithms in the caching of the micro-computations that form the part of the query execution process. The net result is that performance can improve in many circumstances as the number of users increases. This scalability is also facilitated by the structure of ElastiCubes, and particularly the ability to form ElastiCube sets, where each ElastiCube resides on a separate server, but the overall set can be treated as one entity.